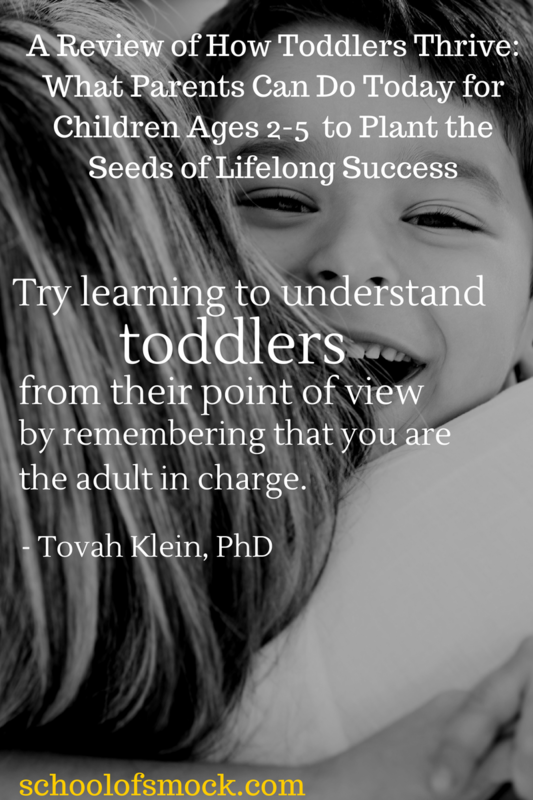 I first heard about Dr. Tovah Klein and How Toddlers Thrive: What Parents Can Do Today for Children Ages 2-5 to Plant the Seeds of Lifelong Success in a piece by science and parenting writer Melinda Wenner Moyer in Slate about clingy toddlers. The article attempts to explain the maddening and near-universal toddler phenomena of periodic bouts of extreme neediness. At the time, my son — in the middle of the (supposed) Terrible Twos (Is there a parent still out there who still hasn’t been told that the Threes are worse?) — was just entering a long, confusing phase. It involved screaming “Mommy! Mommy! I want Mommy!” every five minutes and clinging to my leg during a good part of the day, and I loved Dr. Klein’s reassurances that, no, I should not sign my son up immediately for a children’s therapist. Instead, his neediness may be a sign that I was doing something right as a parent, that he viewed me as a “secure base” from which to which explore his world. Within weeks, I got a review copy of How Toddlers Thrive, and I was a believer in understanding the toddler mindset as a way of handling his often exasperating and baffling behavior. Despite how much I believed in the book’s main thesis that seeing the world through a toddler’s eyes is the key to good parenting during this tumultuous period, most days I still feel like have no idea what I’m doing. Yesterday, as my three year old screams his trademark ear-splitting shrieks, kicks, and cries like a wild, deranged, wounded animal in his stroller, my husband and I do the Toddler Parent Walk of Shame through our busy, urban neighborhood. We walk silently, making no eye contact with our neighbors in the crowds coming to and from our local farmers’ market on this late Saturday morning. I know what I will see if I look up and meet my fellow Buffalonians’ eyes: several glances of pity, a few more looks of confusion, empathy from some, and quite a lot of annoyance. What I keep thinking as I walk/waddle (I’m 25 weeks pregnant, after all) home is that this whole meltdown is my fault. Rookie mistake, I think. Tovah — that is, Dr. Tovah Klein aka “The Toddler Whisperer” — would not be impressed by our parenting this morning. We’ve failed our son. My husband, in contrast, draws a very different conclusion. So what happened? What caused this meltdown, which lasted for much of the next hour or two of this perfect summer weekend day? It was that promised muffin. But it’s never just a muffin, is it, when you’re dealing with a toddler? The farmers’ market is part of our Saturday morning routine. My son loves exactly two things about the farmers’ market: the Humane Society booth with kittens on display and the bakery booth, from which he always gets a muffin as his Saturday breakfast. But this morning was different, a disruption in his weekend routine. My husband had to go into the office so he brought our son along. They also did a bunch of errands and fun stuff: the car wash, Home Depot, a hair cut at the barber’s, a stop at the Hobby Train store, the pet store. They were gone for hours, and by the time they got back, our son was a very tired boy who couldn’t stop rubbing eyes and it was just about lunchtime. But he — and I — still wanted to go to the Farmers’ Market (I love fresh corn!). Despite my hard-earned prior knowledge about what happens when we brought our tired and hungry toddler anywhere, we set off. He shrugged and got ready to move on. Did he really think we would get off that easily? The screams started several feet away as soon as my son realized that we weren’t buying a beloved muffin. How Toddlers Thrive fresh in my mind, I tried to label his feelings and empathize. “I know. You’re so sad that there aren’t any muffins. We like our muffins, don’t we? I’m so sad too. I’m sorry that Mommy and Daddy promised you a muffin, and the muffins are gone.” I gave him a hug and held him as he first began to cry. I repeated soothing words but the tantrum escalated. So we fled home. And I felt like a parenting failure. But only until I got home, settled him down, and looked again at the book. Dr. Klein tells parents that tantrums are inevitable. Literally, their brains are wired for them. They can now form their own ideas and desires (“I want my delicious muffin NOW!”; they have no sense of time (“We can get you a muffin next Saturday” is meaningless); they have begun to experience more intense and new emotions and yet their brains are not sophisticated enough to develop strategies of their own for handling these emotions. What matters, she argues, is how parents handle the “repair”: how toddler and parent “make up” after the explosions. Overreacting, yelling, and showing frustration are inevitable sometimes; no parent is perfect. A child is more likely to settle down if you show that you’re there for them and comfort them. And as I reviewed my notes, I realized that I did quite a few of the things that Dr. Klein recommends that parents do to raise resilient and happy children: I did not shame my son for having his need or desire; I stayed with him through the tantrum and comforted him; and I tried to make a “repair” after the tantrum was done. So why is my son still such a terror so much of the time? After reading this book, I think I know the answer, but I’m not sure that I like it: It’s because he’s a toddler. That’s the reason. According to Dr. Klein, there are no quick fixes, no magic recipe for discipline success. Toddlers thrive on routines, structure, and boundaries. Dr. Klein wants parents to trust themselves as models for how to react, how to talk about feelings, and how to deal with struggles. Before I became a parent, I used to watch the reality show Supernanny. Doesn’t she make good parenting look like a breeze? A few times on the Naughty Chair, a reward chart, and a trip to the park as a family, and the kids were all fixed. Dr. Klein’s approach is the opposite of that. We all want quick fixes. But for right now I’m thinking that Dr. Klein may be on to something. As my little boy learns about the world, I’m learning more about myself too. What questions do you have about toddlers? Which parts of toddler parenting baffle or frustrate you the most? Lauren of Omnimom: Should Young Kids Be Expected to Listen to Their Parents? I was shouting at the screen before you made your own realization — tantrums are inevitable! 🙂 And I think you are right — toddlers are toddlers. If anyone had the magic recipe, she would be rich and famous. I think just knowing in the back of my mind that it’s normal for a toddler to create a scene over a lost muffin opportunity is enough for me to not get so worked up over it. I felt the same way over the section on “sharing” (which I wanted to write more about but ran out of room! ): 2yo’s don’t know how to share, so quit trying to force it. Now I can feel better letting my son work it out on the playground. So liberating. I also found that I am doing many things the way she suggests (like mealtimes, tantrums, etc). I guess I didn’t find anything all that revolutionary in what she was saying. Her approach is very similar to How to Talk So Kids Will LIsten and LIsten so Kids Will Talk, which also places a large emphasis on empathy and putting the child’s emotions into words. I love the muffin parable and I think ‘it’s never JUST a muffin’ might be my new mantra. Your son at least goes by the book: his extreme reaction was due to a clear cut break in the routine. That’s heartening. And my husband would agree with yours, which does create a dynamic where I am seen to be the indulgent one (even though, according to Tovah, the ‘indulgence’ is warranted and shouldn’t necessarily be conceived of as indulgence). I’m curious to what degree this is a gender thing. There are times I’m convinced my husband thinks our family should be a scene out of Father (or Mother, for that matter) Knows Best! Lauren Apfel recently posted…should young kids be expected to listen to their parents? Oh, I can so relate to the muffin incident. We have those reactions regularly– often regarding food, ironically: we’re out of the right color yogurt tube, the apples were cut improperly, the granola bar broke… It really has helped me feel less frustrated to think of how important these things are from Sophie’s perspective. But you’re right- there are no easy answers and I think we just have to ride it out. Glad we read this book! When my 2 sons were toddlers (they’re now 28 & almost 30 – 19 mths apart in age), I spent a lot of time on the phone with my BFF who also had 2 young sons. We would hash out the, “why this?” and “why that?” And then I discovered the best book I’ve ever read on child psychology, Eda LeShan’s “When your child drives you crazy” — the title is catchy, yes? This was many years ago but I’ve never forgotten the universal truths (ie, understanding the child’s perspective) and skills that help us, as parents, to understand that we’re doing things okay. Kids don’t come with instruction manuals. I’ve always turned to books (& the internet) when trying to figure things out. It sounds like Klein’s book on toddlers is spot-on. Just thank you for this article. A very interesting topic, parents check this site now. Very helpful and reliable!